The 400-year epic history of immigrant New York. The story of how those waves of millions, and those groups who came before and after, cascaded upon American shores is told brilliantly, even unforgettably, in Tyler Anbinder’s City of Dreams ... Anbinder is particularly strong on the ocean passage of the Irish (unbearably difficult), the travails of the Irish (especially those of female domestic servants), and the barkeeps of the Irish. A richly textured guide to the history of our immigrant nation’s pinnacle immigrant city has managed to enter the stage during an election season that has resurrected this historically fraught topic in all its fierceness ... Anbinder devotes at least one chapter to each of the major immigrant groups — Irish, Germans, Russian Jews and Italians — vividly detailing the political turmoil, famines and pogroms that led them to leave their homes and families, the horrific steerage voyages across a turbulent Atlantic Ocean and their lives in New York ... 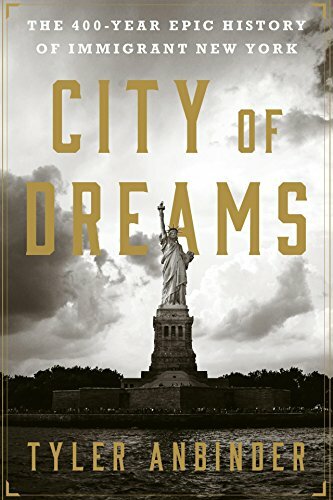 The text of City of Dreams clocks in at nearly 600 pages, yet it gives little insight into how newcomers like these assimilated, and how their children and grandchildren were educated into the growing middle class, as they so often were. To delve into that question, an especially crucial one today as immigrants struggle to make their way in an 'hourglass' postindustrial economy, readers of this admirable history will have to look elsewhere. The American Immigration Act of 1891, which established the immigration center at Ellis Island, imposed greater health requirements on steamship companies, stricter regulations at ports of embarkation and rigorous medical examinations for the arrivals. Mr. Anbinder, citing his own forebears, offers us a striking picture of what these immigrants underwent ... It is a pity that, given his omnibus approach, Mr. Anbinder devotes little more than 60 of his 570 pages of text to this third great wave of immigration, one of the most exciting chapters in the city’s immigrant life ... Mr. Anbinder has provided a valuable service by crafting a single volume that focuses solely on New York as a gateway, a haven and a crucible that forged the fates of millions of immigrants who in turn shaped the destiny of our nation. What did you think of City of Dreams: The 400-Year Epic History of Immigrant New York?